From close board fencing to repair and replacements, Pickets or Panels and even trellis - we can do it all. If you’re looking to maximise your outside space then we’re here to help. We can provide anything from a patio to a walkway, retainers and planters or water features to planting plans. We can help you realise your dream garden space. We can tackle any aspect of brick work from a small garden wall to a home extension. From repairs to repointing, whatever you need it’s not a problem. 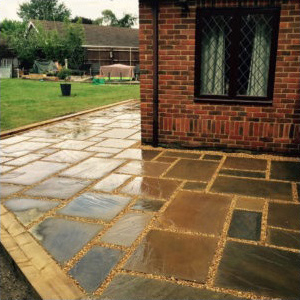 Driveways and patios come in all shapes and sizes from block paving to shinge or cobbles, setts and concrete. Let us know what you’re looking for. We can tackle it for you. We’re able to undertake all manor of groundworks from bases for your shed or hot tub to footings and drainage. If you’re in need of a soakaway or french drains then just get in touch. Have you been thinking about having some work carried out but you’re not sure it’s possible? Give us a call, we’ll gladly offer a no obligation quote. We always use quality goods in all of our jobs so can deliver the best end result to you - our customer. With 25 years of combined experience, Mark and Craig have built Groundshield to be one of the highest rated companies in their area on the popular Checkatrade website. With numerous jobs completed to the highest of standards, they maintain a professional and courteous manner when undertaking any job, regardless of its size. Feedback, Directly from our customers is so important to us. It lets us know that we’re doing a great job and that our customers appreciate the end results we achieve for them. Customer Ratings out of 10. Please feel free to contact us regarding your needs for landscaping and construction. We’re happy to offer a no obligation quote free of charge.